I was a very lucky girl when the lovely Taheerah let me buy one of her Papertrey CHA sets that were exclusive to the show called Four of a Kind. I love how versatile it is with 4 different flowers. I whistled off a few like the one above but forgot to photograph them. 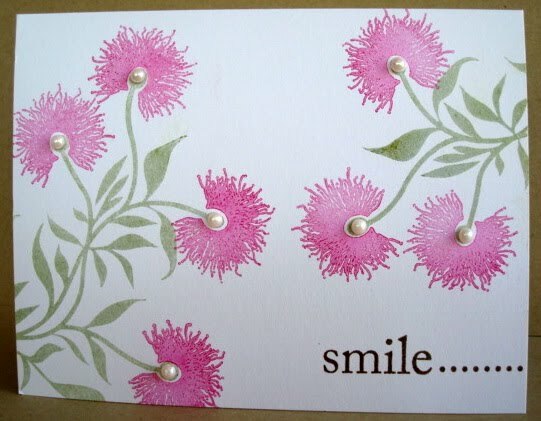 The one above is a one layer card stamped in Chartreuse and Raspberry Fizz. The one below is all in Plum Pudding and Chartreuse again - love the new inks even if they do stamp a bit unevenly! 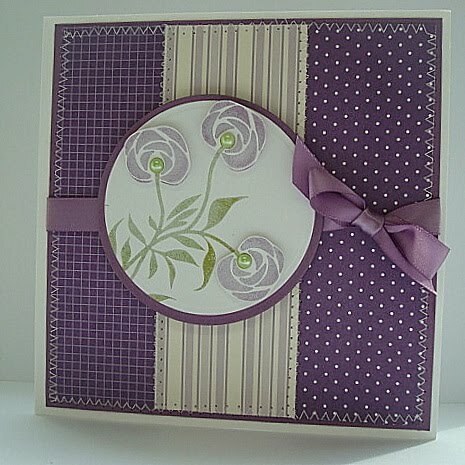 I used Plum Pudding DP (Dots and Squares) from Papetrey with a little strip of old Anna Griffin DP. I haven't decided on a sentiment yet - if I use one at all as in life I think this card looks a lot prettier that the photo! The roses are popped up on dimentionals to give it a bit of a lift. The challenge over at A Passion for Papertrey this week is to make a square card and so I think this fits the bill! Thank you for stopping by and I hope you have had a grand weekend! This is very pretty ! I love your colour scheme and the style is very Charles Rennie Mac - big favourite of mine ! Gorgeous cards! Somehow I missed this post of yours. Oh you lucky thing getting your hands on this set!!! I love what you've done with it and your square card is fabby! Great dimension with those sweet roses! 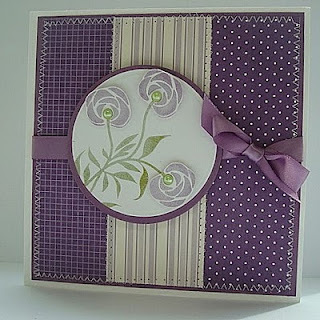 I love the colour of your pretty card and those roses look so Rennie MackIntosh. Lucky girl to get those new stamps!